As the number of food movement groups promoting different, yet overlapping, food and agriculture solutions continue to increase, it is essential that they include not only the voices of people from diverse backgrounds but their leadership, too. 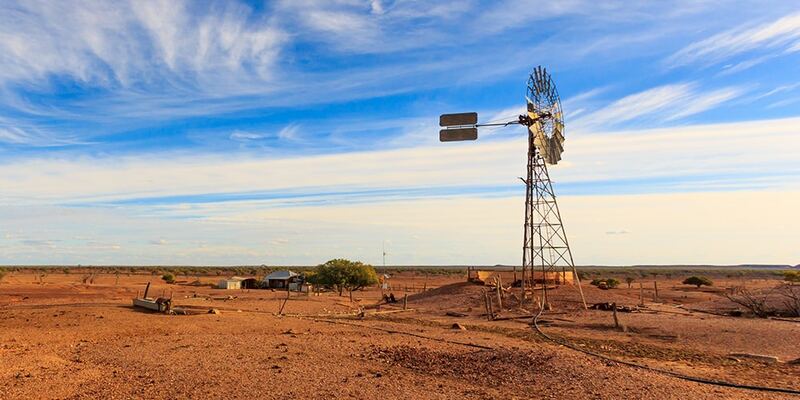 ‘Old Australian windmill during drought in outback Queensland, Australia.' Image sourced via Shutterstock, stock photo ID: 380937559. The industrial agri-food system is at the centre of some of the most pressing global environmental, economic and political crises of our time. It is a dominant force behind environmental and ecosystem degradation, greenhouse gas emissions, natural resource depletion, unsustainable water extraction and contamination, land degradation, biodiversity loss, deforestation and the depletion of fish stocks.1 It lies at the heart of a global public health crisis spurred by the erasure of traditional foodways and increases in diet-related disease, and the restructuring and displacement of rural and agrarian livelihoods worldwide. This nexus between agriculture and the economy, the environment and society have spurred global interest at the highest levels for creating sustainable agricultural systems, while more and more citizens are becoming aware of the multiple negative impacts of industrialised agriculture and what some call the corporate food regime. “Alternate” food movements are rapidly growing all over the world, combining social, environmental and political activism through a philosophy that aligns cultural and planetary health. As a movement of movements,2 the food movement represents a convergence of social movements surrounding social, economic, environmental and political debates by placing food and agriculture at their centre. It is both local and transnational, rural and urban, and encompasses various social groups of racial, gender, socio-economic and age diversity. It recognises how our food systems are powerful and pivotal sites for systemic transformation3 that can help build social equity and ecological integrity worldwide. The vast diversity that the food movement embodies, however, can act as both its major strength and weakness. Competing visions and narratives for the future of food not only play out within academic and research institutions, governing bodies and the media,4 but also within the food movement itself. These competing visions fall primarily into two camps: one that proposes market-based strategies to food system issues and another that calls for a deeper structural analysis of food system inequalities through food justice and sovereignty. Market-based strategies can include CSA projects and cooperatives, organic farming enterprises, farmers’ markets, food banks and meal programs, or social enterprises that repurpose food waste. These strategies bring about tangible benefits to farmers and communities alike: farmers are able to stay in business without the economies of scale necessary for supermarket- or export-oriented production, they improve food access and availability for different communities, can help minimise the environmental costs of industrial agriculture and redirect food that would otherwise end up in landfill. But the alternatives that these strategies create can overlook issues of oppression and privilege that occur on the basis of race, income or immigration status that disproportionately affect indigenous peoples, low-income earners and migrant populations in conventional and alternative food systems alike. Diverse voices – like those that stem from the food sovereignty and justice movements – are essential to the radical reimagination of a sustainable and just food system,7 but their ability to be heard is complicated by systems of power and privilege that accede some food narratives over others. Narrative capital,8 like all kinds of capital, is not evenly distributed within society, or the food movement. Those who command more resources and status are more likely to dominate the discourse – and action – that surrounds food and agriculture issues. At the most basic level, an effective movement to address Australia’s food and agricultural issues must make a commitment to the inclusion and elevation of the voices traditionally not welcome at the table of power. Ultimately, no set of solutions created under a single cultural and social system is likely to produce the kind of transformative change required to ensure that every Australian eats well or has access to productive resources. Building coalitions across class, race, ethnicity, gender, and age matters, because it defines and delimits the actions we take in building the food utopias of the future. 1. Foley, J. (2011). Solutions for a cultivated planet. Nature, 478(7369), pp.337-342. 2. Holt Giménez, E & Shattuck, A (2011). Food crises, food regimes and food movements: rumblings of reform or tides of transformation? The Journal of Peasant Studies, 38(1), pp.109-144. 3. Holt Giménez, E. (2017). A foodie’s guide to capitalism: Understanding the political economy of what we eat. New York: Monthly Review Press. 4. Lang, T., & Heasman, M. (2004). Food wars: The global battle for minds, mouths, and markets. London: Earthscan. 5. Mares, T. & Alkon, A. (2011). Mapping the food movement: addressing inequality and neoliberalism. Environment and Society, 2(1), pp. 68-86. 7. Winslow, D. (2017). Language and power in social movements: Hearing all the voices in food system advocacy narratives. Green Humanities, 2(1), pp. 26-52. 8. Gálvez, A. (2018). Eating NAFTA: Trade, food policies, and the destruction of Mexico. Oakland: University of California Press.